COLUMBIA - Changes to the state constitution regarding medical marijuana go into effect Thursday, but it will take more time for it to take action. 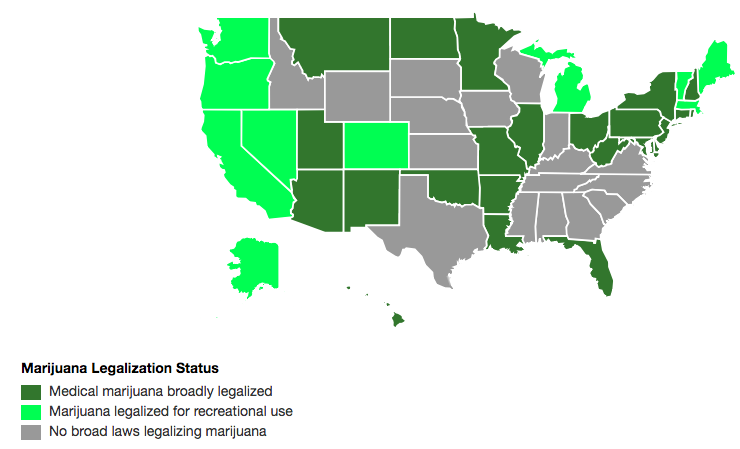 Missouri will become the 32nd state to legalize medical marijuana with the passing of Amendment 2 in November's election, according to the map from Governing Magazine. The measure allows patients to legally use and grow their own cannabis for medical reasons. The amendment will impose a 4 percent sales tax that will go to the Missouri Veterans Commission to benefit veterans care and services. New Approach Missouri President Dan Viets says it will still be until next year for people to access cannabis. He believes that people who are allowed medical marijuana from states with legalized marijuana will be protected. "I believe you would have a very strong defense, if you are a legal patient from other state, you will be protected from conviction," said Viets. Viets said that although you may have a strong defense, it does not prevent from you being arrested for marijuana possession. National Organization for the Reform of Marijuana Laws supports repealing the prohibition of marijuana by educating and promoting the responsible use of it. MU's chapter president Aspen Sennewald thinks that medical marijuana in Missouri is the first step to full legalization. "I really want to destigmatize cannabis as a drug used in society. I would rather it be regulated and consumed similarly to how alcohol is," said Sennewald. Although Sennewald has supported Amendment 2, she does not advise anyone to start possessing or consuming cannabis in the state without their proper Missouri medical marijuana card. Senewald hopes that in "day to day life you can go buy it and not be judged, not be prosecuted, not get your house or your kids taken away because you want to safely consume a medicine or you want to safely treat a medical ailment that you have."